Adam’s Peak, also known as Sri Pada, is a 2,243m (7,359 ft) mountain in the central highland region of Sri Lanka. Popular for Sri Lankans and tourists alike. The typical climb is started in the middle of the night so you can reach the peak for a breathtaking adams peak sunrise. Muslims & Christians – believe it’s Adam’s first step after being exiled from the Garden of Eden. Whatever your beliefs, waking up in the middle of the night to trek was worthwhile and the sunrise is nothing short of spectacular. Should you get travel insurance? Yes. With any trekking there is an inherent risk We use and recommend World Nomads travel insurance. They covered us when I needed surgery in Vietnam and when Anne was in a motorbike accident in Bali. 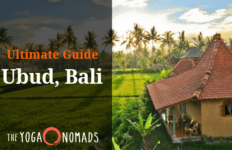 We published an epic guide to Travel Insurance which explains what it covers, how much it costs, and why we think all travelers should be covered. Most people take a train to Hatton and then a bus or tuk-tuk t0 Dalhousie. Hatton can be reached by train or bus from Colombo, Kandy, Ella, etc. Buses leave every 10 minutes and the ride is beautiful. Most people take a train from Kandy to Hatton, then take a bus to Dalhousie. You can check the train schedule here. The best way to get to Adams peak fromColombo is by train. 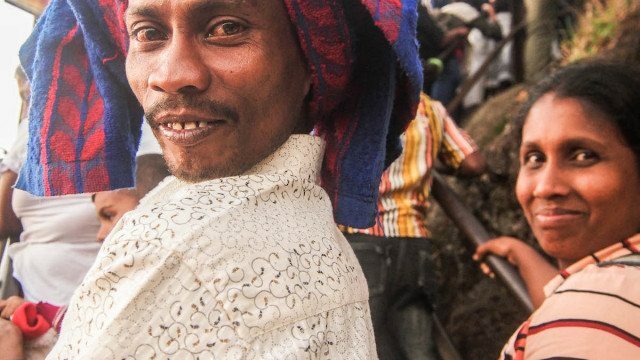 Head to the train station on the edge of Colombo and jump on a train to Hatton. Then take the bus or tuk-tuk to Dalhousie. That being said, some travelers prefer to hire a driver for their entire Sri Lankan tour. 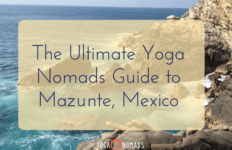 This costs quite a bit more money but it makes you more flexible and cuts down on travel time. We loved the public trains in Sri Lankan even though they are slower. So much beauty in this country! Most people take a train from Ella to Adams peak. The Express train takes about 4.5 hours. Adams peak is approximately halfway between Ella and Kandy. We must mention that the train ride from Ella to Hatton (nearest station to Adams peak) is beautiful and many people consider it a highlight of their Sri Lankan adventure. You’ve most likely arrived to Hatton by train. Congrats you’re almost there! The next step offers you some options. The cheapest (and slowest) way is to take the bus from Hatton to Dalhousie. You can also take a taxi or tuk-tuk, however we recommend spitting it with other hikers to save money and meet some friends! Taxi takes between 60-90 minutes and the bus is a little longer. 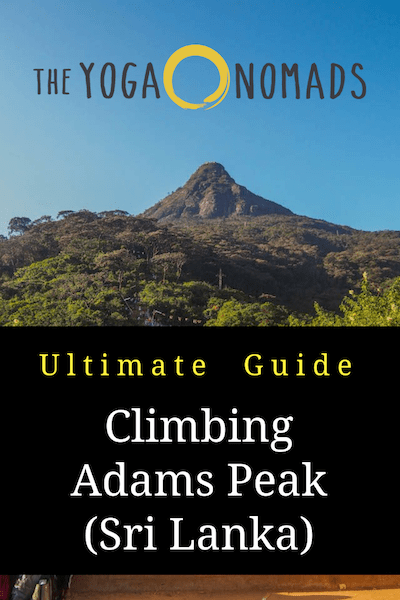 What type of climb is Adam’s Peak? Mix of incline trekking and 5,000-6,000 crumbling stone steps. 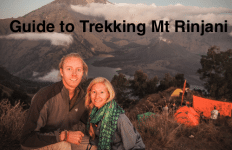 Challenging but nothing like climbing Mr Rinjani in Indonesia. Going up is ok, but going down is very hard on your knees and IT bands. No technical climbing necessary. Takes most people 2-4 hours to summit based on fitness, crowds, and breaks. 1-2hours to come back down. Climbing Adam’s Peak (Sri Pada) is very popular for tourists and locals alike. 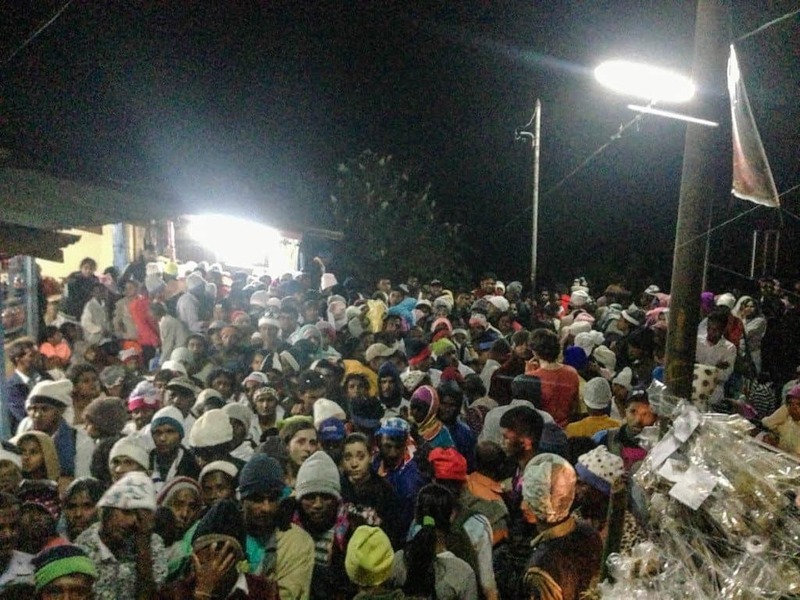 Avoid peak times or you’ll be surrounded by religious pilgrims and Sri Lankan families for the trek. Bathrooms are found every 20 mins during the trek. They will be disgusting – what did you expect? January – May. Avoid days near the full moon and the week of Sri Lankan New year (mid April), and the weekend if possible. During these busy times the trek will be so crowded you may have to wait 5-10 hours in a line to reach the peak. Unknowing to our fate… we started our trek on the Sri Lankan new year, and 2 days after the full moon. The perfect storm. It was like climbing endless stairs in a crowded mall the day before Christmas. We were 98% on the top (we could see it) and yet the line was supposed to take 5 or more hours. Sad to say we never officially reached the peak. Although, we still had a great time and saw an outstanding sunrise. How many days should you stay in Dalhousie? Most people stay for 2 nights which is enough to see the town, make the trek, and spend a day resting your legs. Dalhousie is in a beautiful area but there are much better places to stay in the central highlands (Ella, Deniyaya, Nuwer Ellya, etc). Arrive on day 1, check out the town and get to bed early (9PM). Wake up at 2AM and start trekking immediately. Plan to reach the summit by 5AM, watch the sunrise, then come back down. You should be back down around 8AM just in time for a big breakfast and nap. Spend the rest of your day enjoying the scenery and stretching your sore legs. The following day get on an early bus to Hatton and take the train to your next destination. Arrive on day 1, check out town, go to bed at 9PM. Wake up at 2AM and start trekking immediately. Reach the summit at 5AM, watch sunrise and come back down by 8AM. Big breakfast and a quick nap before taking the 11AM bus back to Hatton. Warning: your legs will be sore and the 1.5 hour bus leaving Dalhousie may be crowded – anticipate standing on the local bus for the journey. Guesthouses for all budgets are available in the Dalhousie area (closest city Adam’s Peak). We stayed at White House and enjoyed our stay. Tons of food and activities are within walking distance of the Dalhousie area. I’d recommend staying at one of the budget or mid range hotels. Most of the budget/midrange hotels are all on one main road. The high end accommodation tends to be on beautiful tea plantations a few miles from Adam peak. 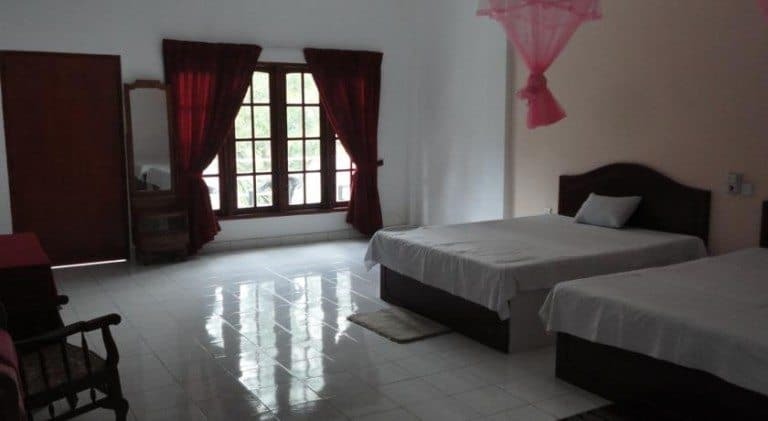 White House [$25 USD/night] clean double rooms at a good price. Great location. Grand Adams Peak [$25 USD/night] – only 350 feet from Adam’s peak. Each room gets a balcony. Great value and location. White Elephant Hotel [$46 USD] Great location, nice digs, great view of Adam’s peak from balcony. Punsisi Rest [$57 USD] Good location and great view. Mandira Craig Appin Bungalow [$225 USD] – Very nice place, great food, great amenities. Tea houses line your trek however it’s best to buy your food/water for the trek in town to avoid high prices during the trek. Don’t worry all the shops and restaurants are open 24/7 to accommodate the trekkers start trekking in the middle of the night. *Top 25 Sri Lankan Dishes you must try! 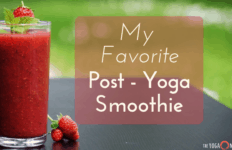 Water bottle – we love this one made by hydroflask, best travel water bottle out there! Besides the Adams Peak hike, there are many things to do: fishing, waterfall tour, spice farm, tea plantation visit, etc. We didn’t do any of these things as the prices were really high and we only stayed 2 nights. Most guesthouses will be happy to arrange for you, of course for a small commission. 1) Reach the peak for sunrise! 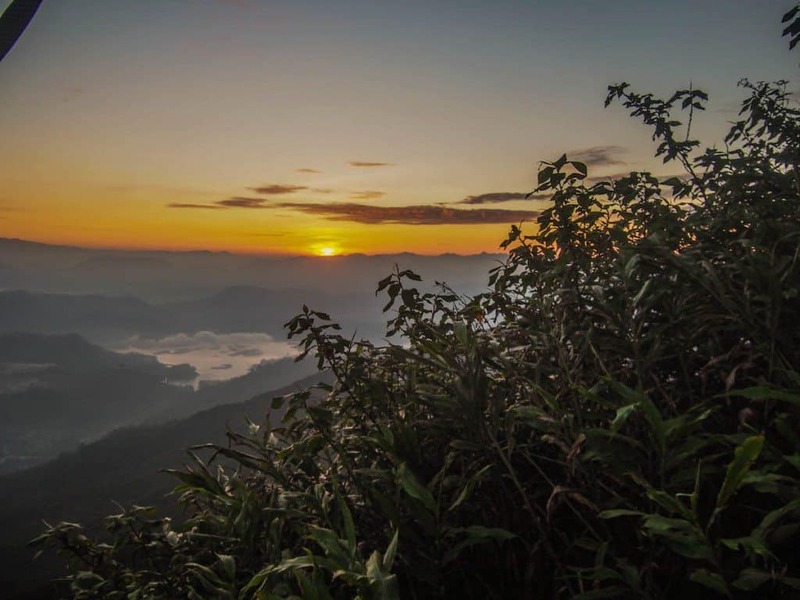 Start the trek between 1-2AM so you have time for a couple short breaks, and to ensure you see the sunrise from the adams peak summit. You will be hot and sweaty during the summit but as soon as you reach the peak you will stop moving and the cool air will chill you to the bone. Trek in a t-shirt, and bring a dry sweatshirt for the summit. The locals will mostly wear long pants, coats, hats, and gloves. Avoid: Sri Lankan New Year (mid April), any full moon, and if possible even the weekend. Your only options on the trek are roti, chips, sweets, and chickpeas. If you prefer healthy food, stock up before it’s too late. Climbing stairs is a different game. Make sure you don’t completely burn yourself out before coming back down. Take some short breaks. You will be climbing up (and down) more than 5,000 steps. If you have knee pain (and even if you don’t) your knees will hurt for a day or two. Be nice to your knees and use trekking poles (or find a stick). My favorite pair of trekking poles is the Black Diamond Trail Ergo Cork. The “bent handle” saves your wrists and elbows on long treks. Cork handles ensure you don’t lose your grip. Collapse down small enough to stow away when you’re not using them. Once the sun rises, the temperature climbs fast. The direct sunlight takes a lot out of you. If you are at the summit for sunrise, you will be back well before 8AM. 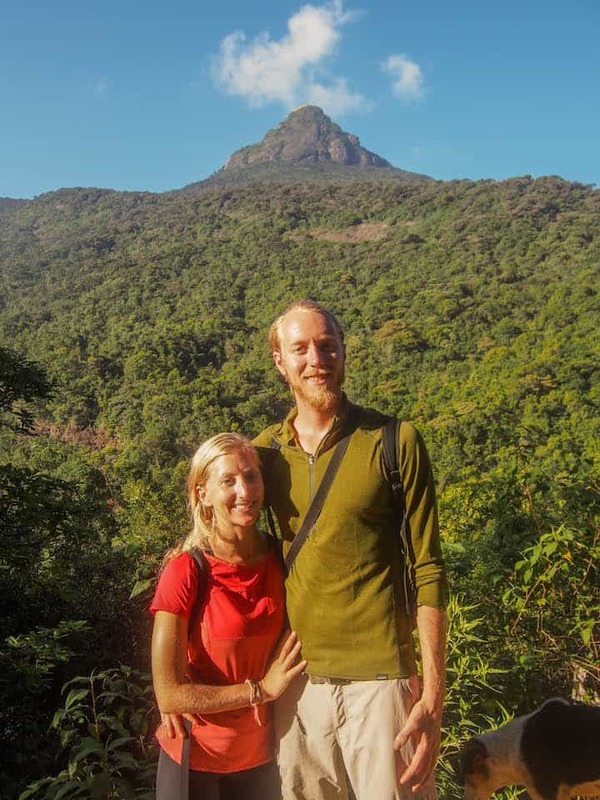 How hard is it to climb Adams Peak? While most people with average fitness should be able to reach the summit, it’s definitely not easy. There are over 5,000 steps to climb (up and down) and for some people steps climbing down steps are hard on their knees (myself included). 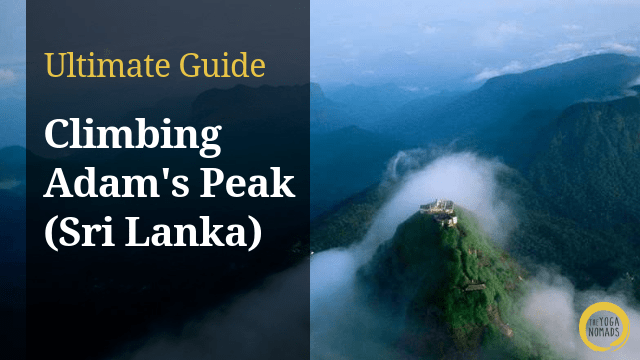 How high is Adams peak? The height of Adam’s peak is around 2,243 m (7,359 ft) which is significant. Also, Adams peak steps are taller and more irregular than normal steps you might find in an office building. Where is Adams Peak located? South central Sri Lanka. Nearest town is Dalhousie. Closest train station is Hatton. Any recommendations for other things to do in Sri Lanka? There are many famous places in Sri Lanka! Besides the Adam’s Peak Sri Lanka hike, we really enjoyed train rides through the central highlands, hanging with elephants, the beach town of Mirissa, learning to surf in Weligama, and eating all the amazing Sri Lankan Food. Other popular places include Sirigiri rock, Yala National Park, and Hikkaduwa, and Ella. How’s the Adam’s Peak weather? As with most hiking, the key to success with the adams peak trek is layers. Most people start around 2AM and it’s often quite cold (locals will wear jackets and hats) and by mid morning it’s super hot. However the temperature fluctuates dramatically depending if you’re looking at the base of the mountain, the peak, the time of day, and the season you’re hiking. I recommend using this site which allows you to check the temp at various elevations. 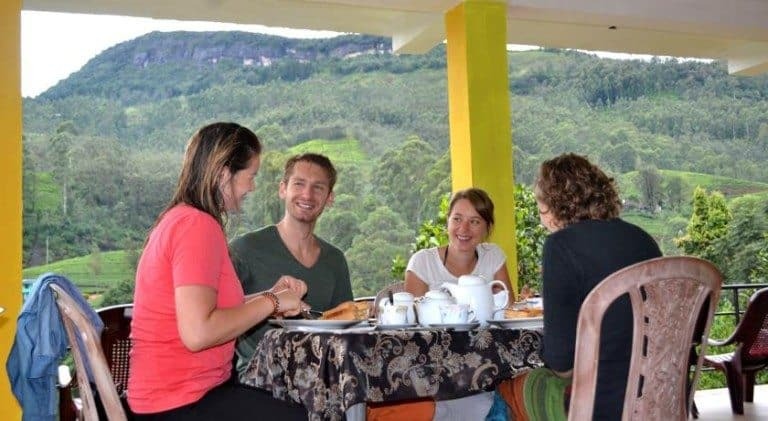 Where to stay for Adams Peak? Most people rent a hotel in Dalhousie aka Nallathanniya which is the closest city. The whole town seems to revolve around the trek, you’ll find many guesthouses, restaurants, and tour companies. Check Guest Houses here. Thanks! 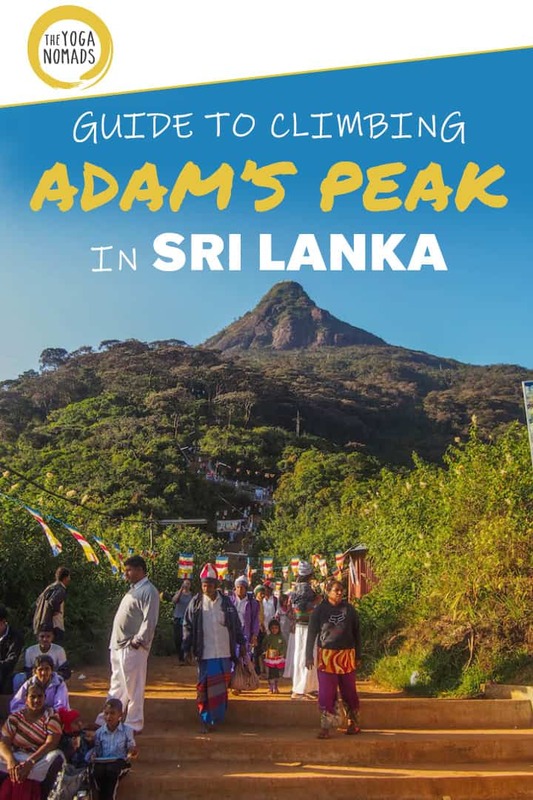 Do you know if you can Adam’s Peak in late October? Thanks Oliver! Glad it could bring back some memories. Nice work on making it to the top, we were so close! Super cool tradition, did you hear people hitting the gong 10 times (for example) representing each time they’ve made the climb? How is White Elephant Hotel.? is it near by starting point. Good call Adam! Sri Lanka has so much to do and see, great food, friendly people, and very affordable! I don’t know why we don’t hear about it more. Having done the trek this morning and reading (with aching legs) your article now, it’s very informative and useful for other travellers. I was compelled to respond to point 7 of your tips ‘blazing your own trail’. I personally found the behaviour of some tourists to be very disrespectful just so they could get there quicker or get the perfect shot. 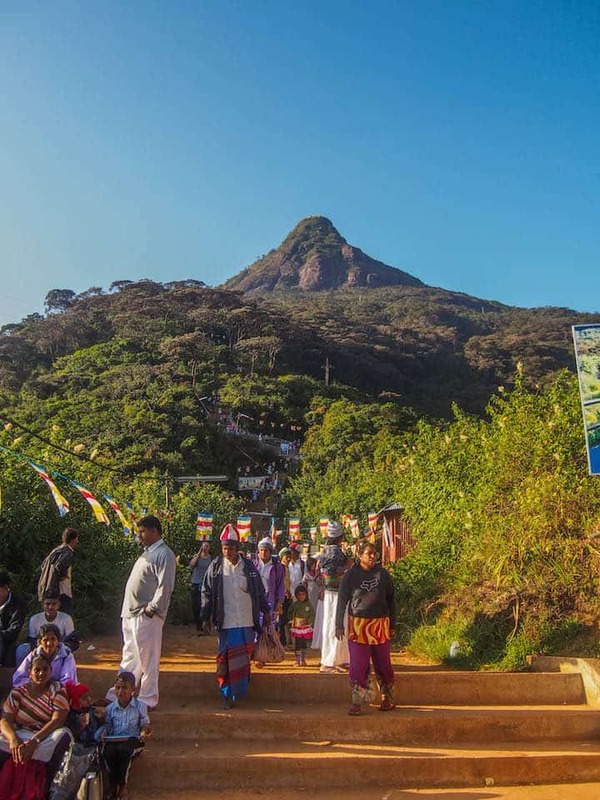 Adams Peak is first and foremost a pilgrimage for the locals. I saw lots of very old Sri Lankans endure pain and hours of trekking to get to the top, for some of them it may well have been their last pilgrimage. So to just skip the queue, or even jump across to the ‘going down lane’ is incredibly rude behaviour and disrespectful. What makes you so special that you feel as if you don’t have to queue like the rest of the locals and polite, respectful tourists? I don’t think you should be encouraging this tip in your article. learned a lot! thank you sooo much! I am born in Sri lanka, visited many times but never got the chance to climb. This information is helpful and highly appresiated.